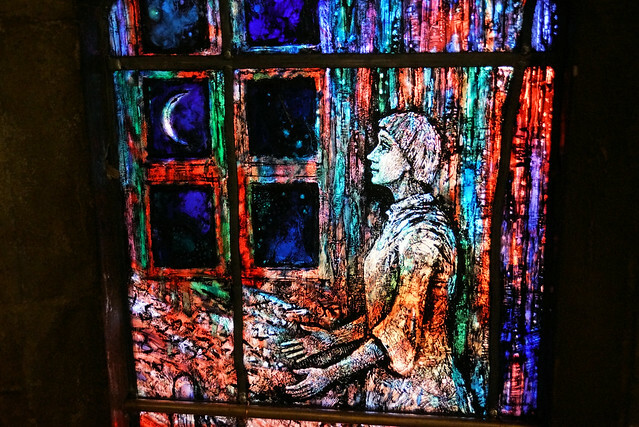 “I thought it was one of the best pieces of contemporary stained glass that I had seen, and resolved that if ever I had a hand in commissioning a window, then the artist who had created this one, Thomas Denny, would be the man whom I would want to use,” he said. “Ecclesiastical art and artists’ expert Dr Peter Burman agreed that Thomas would be the right artist to approach. I was delighted when he agreed, and found him a most charming and amenable person to work with,” said Fr John. Thomas has created over 60 stained glass windows including for Durham Cathedral (the Transfiguration Window), for Hereford and Gloucester cathedrals, Tewkesbury Abbey and Malvern Priory. He was also responsible for the Richard III windows at Leicester Cathedral and created the Wisdom Window at St Catherine’s College, Cambridge. “The commission was to make a pair of windows on the theme of The Divine Mercy visions experienced by St Faustina, a Polish nun who had extraordinary encounters with Christ in the 1930s,” explained Thomas. “There are a number of Polish people in the current congregation who Fr John hopes will feel a special connection with the windows,” said Thomas. Pictured above are Thomas Denny and Elizabeth Hippisley-Cox installing one of the windows. Click on the picture below to see a full picture gallery.